The curse of the cup final has struck again; and whoever gets to the final next season must loathe ever being branded as favourites! 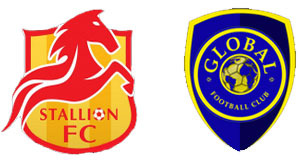 No disrespect to Stallion Penson FC; but Global FC were the betting man’s favourites, arriving as they did for last night’s UFL Cup Final as league champions and with an almost obscene abundance of talent, many of them full Philippine internationals. The cup, wherever in the world, however, is nothing if not romantic; a competition in which reputations count for little and fortune goes to those who dare. So thus, it was up to Stallion Penson FC – only on its second season as a top-tier team – to reprise the role of David as played to perfection by the Air Force last season. There was, perhaps, less in the way of melodrama compared to last year as the Stallions, but for a momentary switch-off to allow Global a glimmer of hope, were good value for and comfortable in their victory. Thus, the cup once again proved itself the great equaliser, respecter as it is not of reputations and platform as it always is for heroes whatever the ilk to seize the moment. Last night, the Stallions seized theirs with aplomb and won some silverware in the process. The Stallions knew that they had pace; and were naturally quicker off the block, moving the ball quickly and pushing goalwards at every opportunity. When dispossessed, they pressed and harried, never allowing Global to settle into any semblance of fluidity. Fittingly, it was Ruben Doctora Jr. – the Stallions’ captain and inspiration – who gave his team just reward for their enterprise by scoring the opening goal. In a well conceived move started by Jason de Jong, Doctora timed his run perfectly to get behind the Global defence in the 25th minute and tuck the ball under the desperately diving goalkeeper. They do say that a team is most vulnerable immediately after scoring a goal. Indeed, the Stallions had barely concluded their celebrations when Global’s Izzo Elhabib got at the end of a long over-the-top ball to nonchalantly lob Wilson Muñoz for the equaliser and prove the old cliché correct again. As the Stallions’ pressing game inevitably tapered down as the game wore on, Global finally managed to get more of the ball possession. The Stallions’ defending, however, was nothing if not obdurate. In a way, it can also be said that the Stallions are actually more dangerous when they are sitting in front of their own goal because of their pace and ability to quickly transition from defence to attack. This was evident when they broke up a Global attack in the 61st minute and inter-passed quickly to get behind Global’s defence with a rapier-like attack down the right flank. The cross was superb; but Spaniard Rufo Sanchez’s diving header for what would ultimately be the winning goal was even more so. It was no more than what the Stallions deserved. Global invariably had to push forward in an attempt to salvage the match; but when they were missing chances that one would have thought on any other day that they would put away, one also got the feeling that it was not going to be their night. It was, perhaps, further proof of the Stallions’ growing stature as a club that they looked comfortable defending their second lead even if there was still half an hour of the match still to play. Needless to say, they had chances of their own to add to Global’s misery. Doctora was also adjudged MVP while teammate Muñoz was named best goalkeeper. A certain Phil Younghusband came away with the Golden Boot. His team, the Loyola Meralco Sparks, defeated Green Archers United, 4-1, in a battle of disappointed teams to claim third place. Acknowledgment: Club logos from the UFL web site.